CMLL iPPV on internet.tv, Impact in Mexico City, NJPW talking to Fenix? Friday’s CMLL show will be streamed live on ROH’s Honor Club service as part of their $10/month service. It’ll also be available on internet.tv for $10 if you’re in the US, and 100 MXP ($6 USD) if they see your IP as coming from Mexico. If you have to use a VPN service to get around the Marca geoblocks, you can do the same thing here to save $4 if you want. There’s a chance the Gran Prix will end up on Honor Club as well; the reason ROH is picking this up is because of Matt Taven being on the show, Flip Gordon is in the Gran Prix, so maybe they air that as well and it’s you get 2 shows for one price. There’s no way of knowing for sure though, and it’s a subscription you’ll to have to unsubscribe to not pay again in 30 days. (The subscription is good for a full month no matter when you cancel – you can do it right after you subscribe if you’re worried. some people have told me they’ve had problems unsubscribing, but I haven’t had that issue.) This is also a big lucha libre show, so there will be all sorts of bootlegged versions if you’re more willing to look for them than to pay. I’m likely going to cut and paste most of that tomorrow, if I post at all. This is the last day of regular service until Wednesday. I’m heading to Los Angeles this weekend to see PWG’s Battle of Los Angeles this weekend, hanging around an extra day on Monday and flying back early Tuesday. I am just about set up with recaps to post during all that time, so something will be up in this space. I’ll write news update if/when I have the time, but no promises on that or an Anniversario recap (which I won’t be seeing live.) I’d like to watch it Saturday, but I’m also not going to sit around a hotel room watching wrestling if there are other things going on. It’ll get done eventually. Tonight is the first of the two nights of Impact Wrestling taping in Mexico City. Tickets for the Thursday show seem to be going better than the Friday night one, for obvious reasons. Impact has announced people on the shows (Austin Aries, Brian Cage, Tessa Blanchard, Eddie Edwards, Fenix, Johnny Impact, Killer Kross, LAX, Moose, Pentagon Jr.). It looks like Hernandez will also be there. No matches announced though. 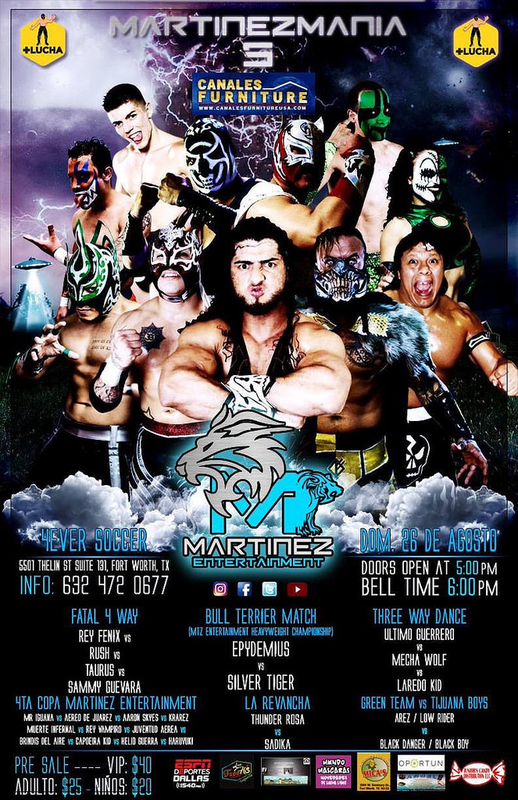 I think you need matches to sell tickets in Mexico – it’s definitely AAA’s theory, which is why they’ve been announcing matches for shows even when they’re not the matches they’re going to run. I do expect AAA wrestlers on these shows, though not the undercard flying guys and more the Psycho Clown guys – though it seems like those names should be advertised if that’s the plan. LAX is really good, but announcing Psycho Clown (if he’s there) is going to mean more to this audience. The WWE stuff is absolutely not new, though people have been treated it like breaking news the last few weeks. WWE’s been interested in Fenix & Penta for years, and the only thing that’s been holding up WWE from making a formal offer is the Lucha Underground contracts they’re under. The status of their contracts hasn’t been publically revealed, though everyone seems to have a theory. Fenix & Penta surely signed the same 7-year deal as most everyone else coming into the promotion, but it seems like they might have redone the deal somewhere along the way and LU has been more willing to just let people leave since the start of season 4. NJPW is new. NJPW has only brought in Mexican wrestling talent thru CMLL for a long time now. Fenix & Penta are in CMLL but not part of CMLL and it’s not clear been if that’s close enough. NJPW is a big deal for the prestige, but also because they pay pretty nicely. It’s also very possible that “All In” means NJPW to Fenix and I’m overthinking it. There’s a lot of factors here, but the distilled version is if it’s a decision between WWE and what Penta/Fenix are doing now, then I believe WWE is the more likely outcome. If it becomes WWE versus “some of what Penta/Fenix are doing now and plus semi-regular NJPW dates”, then it’s more of a toss-up. In somewhat related bits, Sin Cara is in Mexico City for the Lucha Libre Expo Museum and was asked why there are no top latino stars in WWE. Sin Cara believes it’s not a question of talent, but of people not getting opportunities. He mentions Penta, Fenix, and Dragon Lee as being good enough to make it in any company, but says it’s harder to stay in favor with a company. Soberano was asked about his recent international trips by TJ Sports. He feels he learned from his experience in RevPro despite losing both his matches, says he’s got no ROH dates at the moment, but will be headed to Japan soon. I assume that’s NJPW’s annual junior tag tournament in October. It also suggests NJPW’s already selected the people for those shows, and maybe that means Dragon Lee won’t be going since he’s not available for those dates at the moment. Razon interviews Cavernario & Rush, who gives Volador credit for being enough of a man to challenge him. But no more credit than that. Volador tells ESTO that he’s had experience on Anniversario shows, but Matt Taven has not, and he’s a little worried the big moment might make him nervous. He’s also worried that he might repeat his last Anniverasrio main event and lose again. He had really good matches with La Sombra leading into their main events and thought highly of him as a wrestler, and does not the same of Rush. Barbaro Cavernario tells MedioTiempo this match is a big opportunity to show what he and all the young luchador in CMLL can do. There’s been no formal offer for him to join Los Ingobernables and he remains loyal to Peste Negra. Cavernario calls Taven one of the most popular wrestlers in Ring of Honor, which doesn’t seem to be the case on Twitter. In another article, Cavernario promises the match of his life. He’s 100% doing the splash to the floor. The El Panchitas column hears Rey Mysterio Jr. will be at the CMLL Anniversario show. As a fan, to watch Fenix & Penta. He’ll be at the Expo Museo Lucha Libre for an autograph signing earlier that day. CMLL looks back at the 1994 Anniversario with Ricky Santana getting the big win, as well as Rush beating Maximo Sxy for his hair. LuFisto is off the DTU show tonight, flying home early, and says she wasn’t paid what was promised because she was leaving early. She’s not the first person to have money problems with DTU, as noted in that post. The +LuchaTV Thursday show is Martinez’s 5th Anniversario show. Last week’s show seemed to not happen due to technical difficulties, but a couple matches from the AAA Juarez were posted on YouTube this week anyway. Hidalgo luchador El Exotico says they’ll be out at least two months after being injured on the DTU show on Sunday. It’s back injury, not a head or neck one, but enough for them to paralyzed for 15-20 minutes. Exotico is grateful DTU/Coliseo Coacalco had a doctor on hand to make sure the injury didn’t come worse. This 5pm show at the Expo Lucha seems like it’ll be interesting. I don’t know about match quality, but this is the only time you’re seeing Microman & Mil Mascaras at the same time. The entire expo seems like it’s going to be worth checking out, and it’s only 110MXP ($6 USD). Volcano makes his Arena Mexico debut. The Micros are back on a Tuesday, with Angel subbing in for Guapito. (The MicroAngel name didn’t last long.) Drone/Cometa should be interesting. The opener will not be interesting. 3) Audaz, Fuego, Guerrero Maya Jr. vs Kawato San, Okumura, Universo 2000 Jr.
NGD take on Soberano and the healthy OneAtos styles team. The Sunday Guadalajara show has what’s essentially a four way apuesta match. 3) Rey Escorpión & Texano Jr. vs Mamba & Máximo and Golden Magic & Hijo del Dr. Wagner Jr.
Maximo/Mamba & Wagner/Magic replaced Traumas on 09/21. Laredo Kid replaced Puma King on 09/21. This was a Twitch stream, then wasn’t a Twitch stream, and now has returned to streaming of Twitch. There’s been some changes today. Puma is off, and AAA Megachampion contender (???) Laredo Kid steps in. The Traums are gone and two teams have replaced him (giving AAA an unfair two teams in the match.) This is still an AAA/ELITE show, and AAA has yet to win one of those.